Rigorous attention to detail is what converts a simple design into a real masterpiece. Although it seems that regular users will not notice the difference, however, as practice shows they not just feel but also see it. It is like Flemish art, which excels in thoroughness and particularization that instantly strikes the eye and naturally stands out from others. Thoroughness rules and when it comes to UI and UX elements, icons are those integral particles that are able to ruin or perfect the whole design. Restaurant-related projects, as befits every elaborate theme with matching pack of glyphs, need special icons that finish off the composition, increase the sense of harmony and make navigation through the project pleasant and enjoyable. Here, you will find 15 carefully crafted icons packs that enrich any interface with fitting and relevant graphics. Specially crafted for restaurant-themed websites, this set comprises 32 subtle contour bar icons that can complement any modern interface and revamp nav bars. It covers vector representation of avatars, bottles, cutlery and other stuff. The designer has created an interesting project, where each hour is described through a series of icons. Thus, 2 pm is reserved for sweets. The range includes pancakes, lollipops, doughnuts, macaroons, popcorn, chocolate bar and much more. Your delicious interface will certainly benefit from these yummy glyphs. Chosen in favor of nifty flat style and calm yet beautiful color scheme, the designer reproduced a dozen tasty, visually appealing food icons that illustrate not only kitchen utensils but also food items such as cake, watermelon, egg or chicken leg. The PSD file embraces 30 sleek outline retina-ready icons that add a touch of elegance to any interface. They look especially good at flat and minimal UI designs, where legibility and clarity are top priorities. Foodikons have a lovely touch of smooth and delicate curves that give each item a playful and joyful appearance. Thanks to subtle line style, icons become ideal options for trendy material-inspired or iOS-powered interfaces, especially those that feature heavily blurred backdrops. Illustricons is an icon pack like no other. It includes food & appliances icons that were carefully designed with versatility in mind so that you have the ability to do more than you can ever imagine. Stylish, flat, clean, solid and outline – that is how the set can be briefly characterized. It includes essential stuff inherent to BBQ party that is flawlessly executed. You can easily use each item individually for improving UI or use it as a bundle in order to create tasty-looking backdrops. The set is aimed to portray autumn, where each icon inherently relates to this time of the year; however, the artist has kindly included seasonal fruits and vegetables in order to complete the work. So that nifty vector representation of apple, peach, pumpkin, corn, carrot, grape, pepper and zucchini is already in your pocket. This small bunch of clean and minimalist icons comprises only some popular dishes that illustrate first/second courses and desserts. Nevertheless, it can easily beautify menu sections and enhance the look of widgets and modules. Tailored for improving small app interfaces related to the food industry and used as a kind of map pins, this set of gorgeous and sleek icons will certainly find its place in the upcoming project. It can instantly identify cocktail bars, brasseries, lunch bars, tea houses or cafes. Available in both PSD and AI formats, the pack may come in handy for fans of different Adobe platforms. Outlined with a fancy appearance, they give a cutting edge to any interface, injecting into it a bit of cheerfulness and artistry. 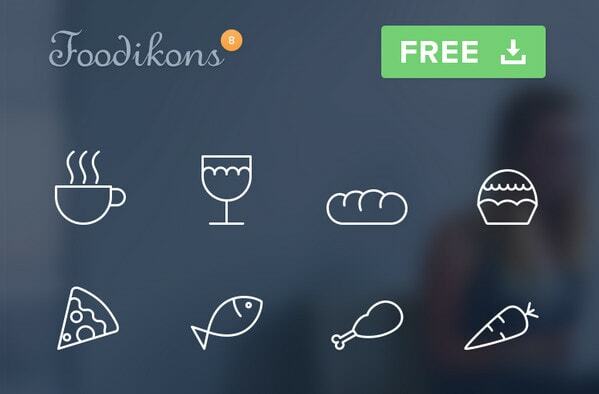 50 Flat Food and Drink Icons naturally grab the attention with its bright and joyful outward. Smooth lines, long shadow, profiled shapes, to say nothing about an eye-catching color palette, your design will certainly win from a splash of such bright and stimulating visuals. The series is marked by a harmonious and appealing tandem of flat and line styles that produce a fantastic effect. Vibrant and energizing it is able to diversify any design. Whether you are up to creating an app or just a basic landing page for a small local restaurant, it certainly meets your needs. It’s the unique package that strikes you with a complex appearance. The artist goes for a more sophisticated and visually interesting look, recreating a bulk of mind-blowing low poly icons with a distinctive and strong three-dimensional appeal. It works well with the flat design with a vibrant color scheme. Vector line-styled icons greatly dominate over others. Although vibrant solid flat icons grab plenty of attention as well, designers often prefer subtle and delicate contour graphics that are capable of unobtrusively enriching UI and making the navigation look absolutely refined.